Every year, US receipt production consumes millions of trees and billions of gallons of water, generating large amounts of waste and emitting greenhouse gases. Ecology Center estimates 93% of thermal paper receipts are coated with BPA or BPS. Research shows that receipts can contribute to human health issues. BPA has been banned from other items because it contributes to developmental, reproductive, and neurological problems. Customers handles a dozen paper receipts every week, and employees may touch thousands in the same time period. Environmental Working Group analysis of Center for Disease Control data shows that retail workers are shown to have 30% more BPA in their systems than other adults. Nearly 81% of Americans have detectable levels of BPS in their urine, and 90% of our exposure to BPS comes from thermal paper receipts. Many retailers are already making the choice to move away from using these papers, but the majority of stores still need to take action. Green America wants to eliminate these toxins from thermal paper and to reduce the waste of paper receipts from companies like CVS. CVS finally rolled out digital receipts in 2016, but its failure to promote this option has resulted in just 5% of its customers using digital. 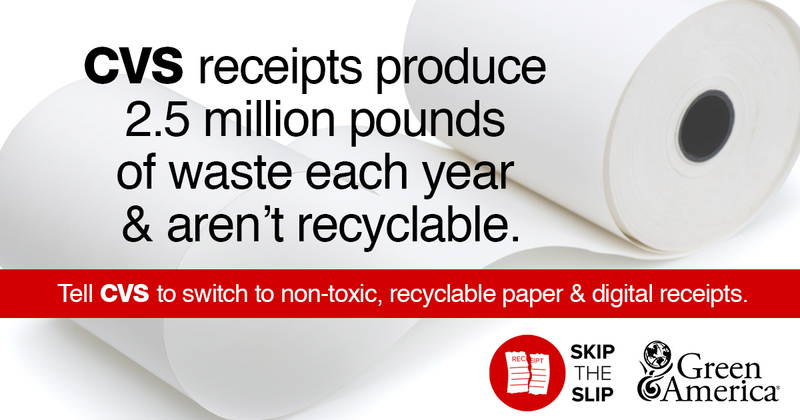 And its use of receipt paper coated in BPS continues to pose health risks to its workers and customers. Green America's Skip the Slip report, updated in January 2019, highlights cost-effective digital and non-toxic solutions for retailers to protect their employees and customers, and reduce their impacts on the environment. Businesses will walk away from this report with a deeper understanding of the unnecessary impacts receipts have on the environment and human health, and also be equipped with next steps for better receipt practices. Access the full report here. If you're a business owner, please review the report above and contact us to learn more. If you’re an employee concerned about receipt contact through your work, learn how to skip the slip in the workplace. Concerned with not having paper receipts? We provide answers to questions about reducing paper receipt usage.